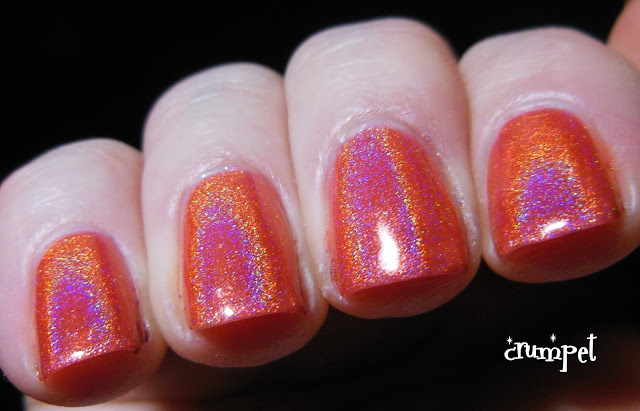 Today I have the 2nd part of my Literary Lacquers post. 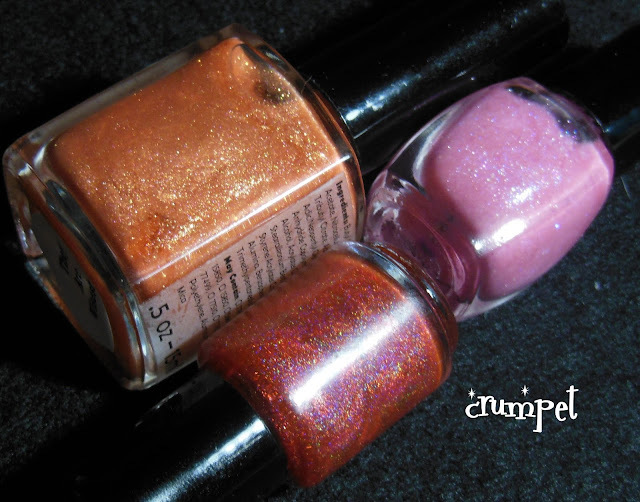 Amy sent me 7 polishes, and today we have the non-glitters. You can catch swatches of Love In Idleness, Mina, The Course of True Love and Midsummer Night's Dream HERE. 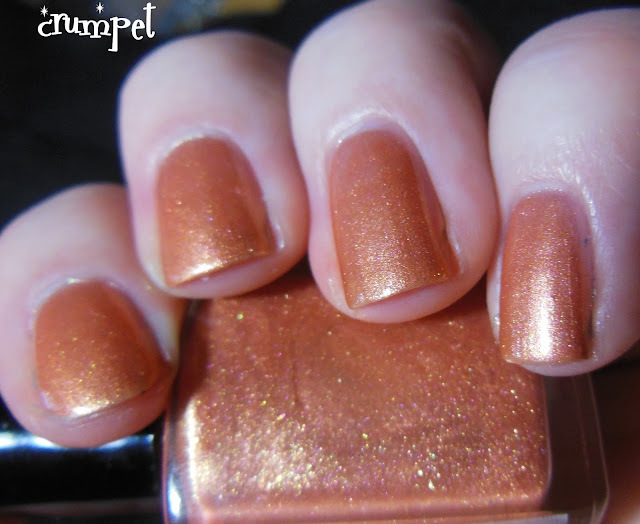 I'm going to start with my absolute favourite from all 7 polishes - Greatest Treasure. I actually had this pinned on my wishlist and I squealed like a baby bunny when I saw this in the package! 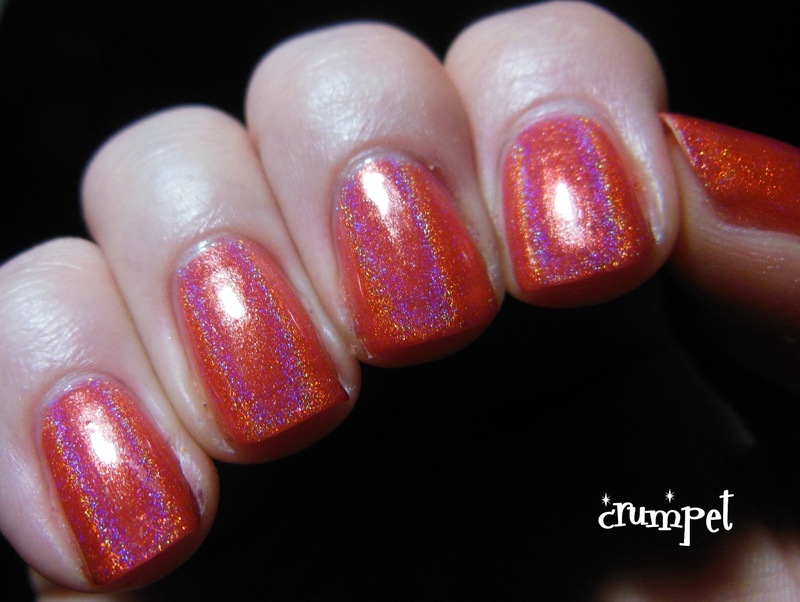 Although Amy describes it as a red holo on her Etsy shop, for me this isn't quite as developed as red. It's in a strange yet interesting country where red, pink and coral collide. 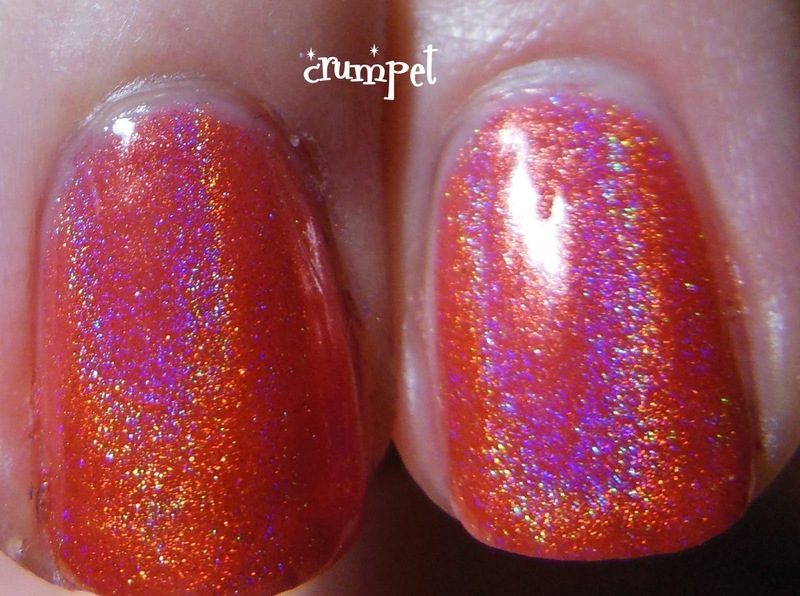 This polish is just glorious. Utterly glorious. I loved wearing it - it's one of those bright, happy colours I gravitate to. More than anything, I could kiss my camera for the photos it took of it - aren't they amazing ? The natural light bulb and the black felt did some voodoo magic and just LOOK at that holo bend! I love how it captures a pink to orange transition. Amazing. 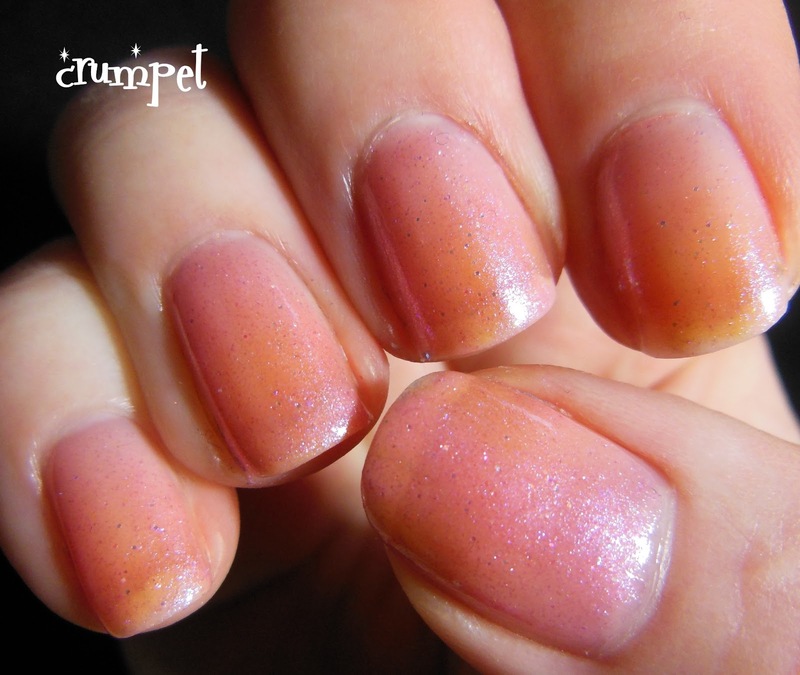 Next we have They Are Wisest, which is a shimmery, pearly frosty dark peach. I really have mixed thoughts on this. 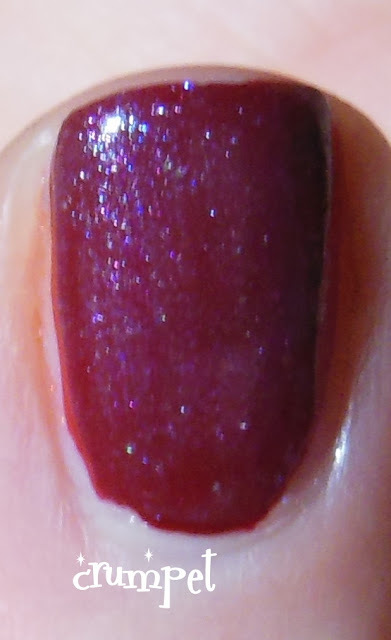 I love the qualities of the polish, but on me, it just misses that spot. This is the 3rd polish I've had now in a similar tone, (one of which was a Nerd) and it just doesn't work on me - it's as if there's not enough depth for my skin tone. Having said that, it looks great in the photos, and I especially like the ones where it has come out softer and warmer. 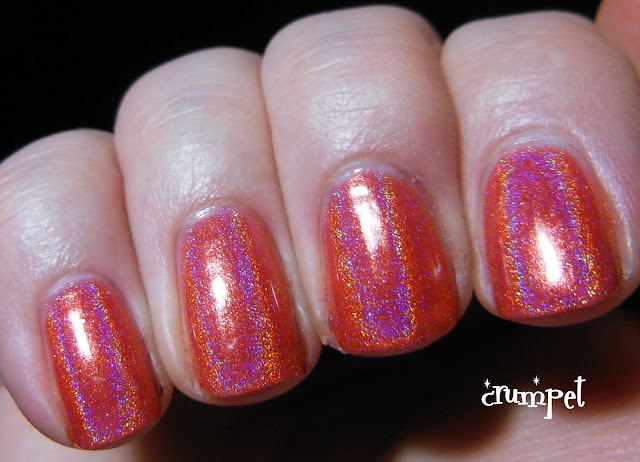 The polish doesn't change colour, but you can definitely capture different tones from different angles and light sources. Finally, the beautifully named Sudden Serious Sweetness. 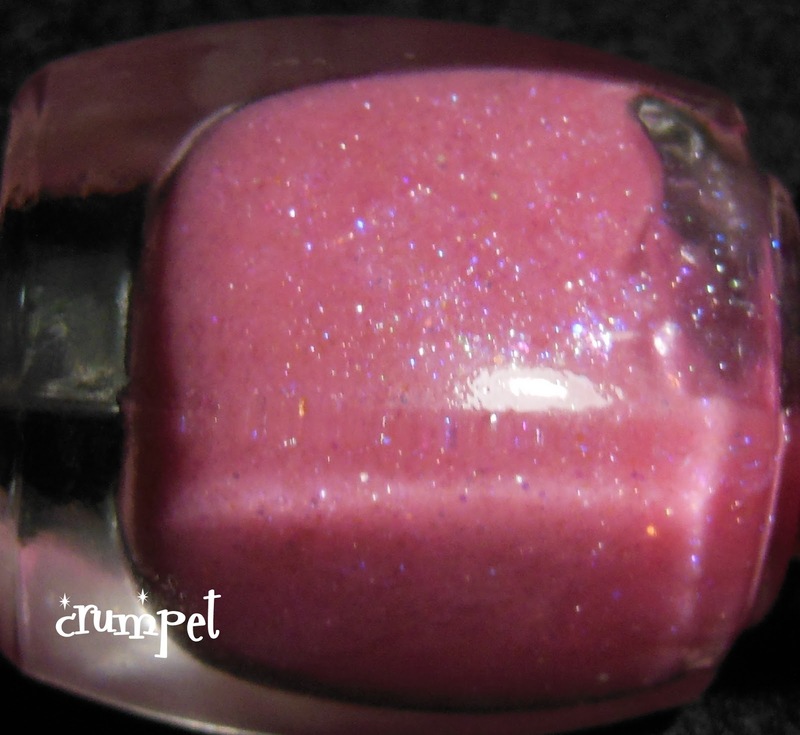 This is a baby pink confection loaded with shimmery sparkle. 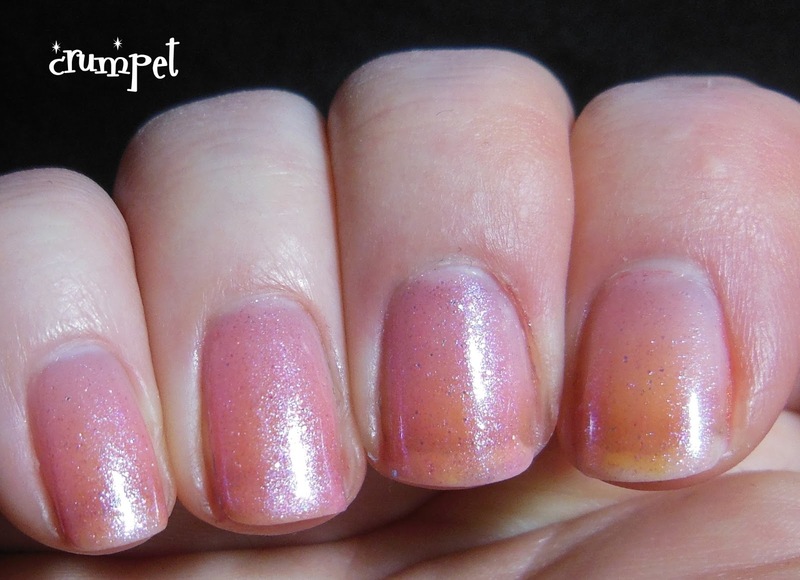 On Amy's Etsy shop, there are already some gorgeous swatches of how perfect this looks layered over a pale pink polish, so I decided to wear this without undies. 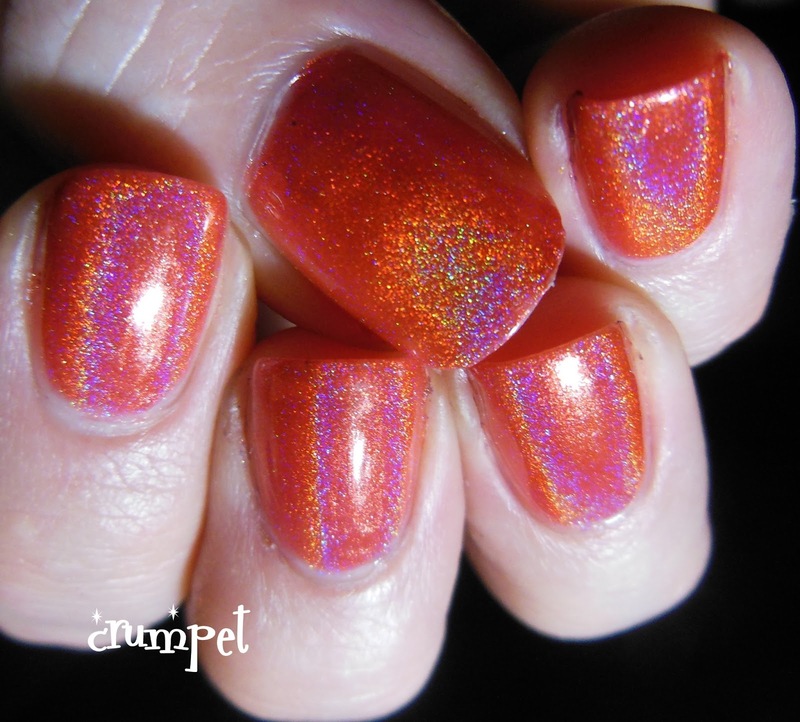 We have 2 coats on index, 3 on middle and pinkie, and 4 on the ring finger and thumb. This is way too pale for me, but I thought you might like to see how it built up. 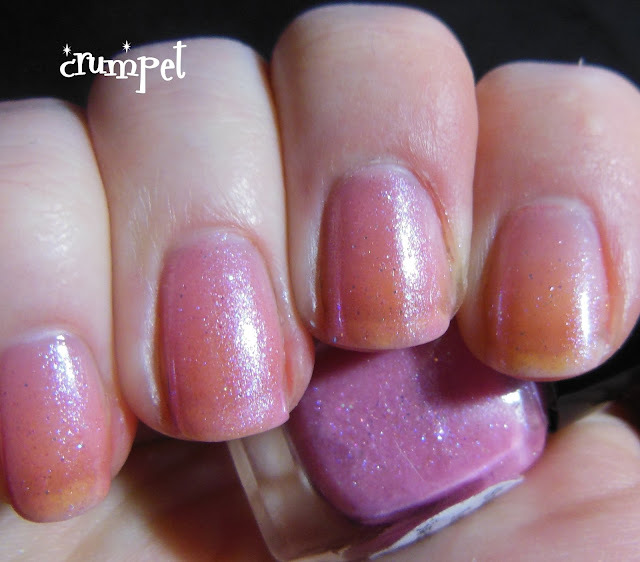 You can also use it as a sparkle dust top coat over a darker polish. Overall, Amy's polishes are great quality for a reasonable price- $10. 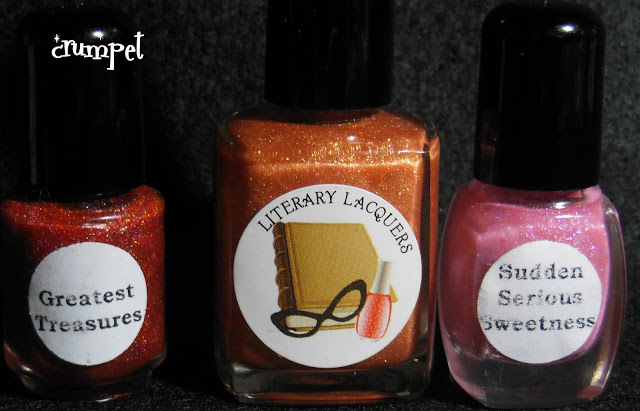 Literary Lacquers are available from Amy's Etsy store HERE and you can follow Literary Lacquers on Facebook HERE. My personal favourites were Greatest Treasures, Love In Idleness and The Course of True Love, all of which have a little something different about them. 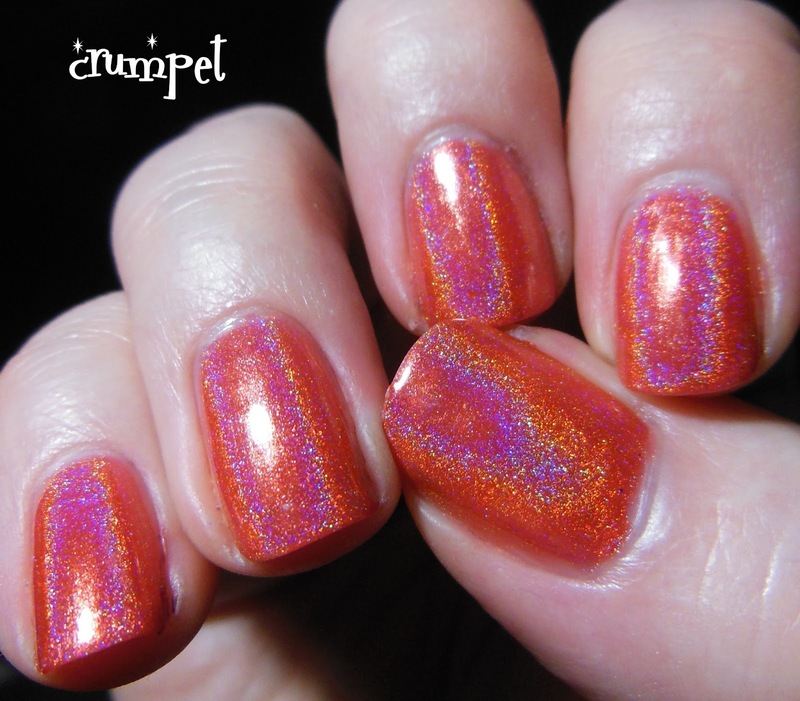 And I think that's what I love most about the polishes she's created so far - none of them are anything other than a little quirky, a little inspired and just that little bit special.